Super Food Ideas – November 2011, Page 31. Photographer: Cath Muscat. This delicious and quick salad is perfect for spring nights and lazy summer lunches. In a large bowl, mix together the green prawns, olive oil, butter, crushed garlic cloves and dried chilli flakes. Preheat a lightly greased barbecue plate on medium-high. Cook prawn mixture, tossing, for 3 to 4 minutes or until just cooked through. Transfer to a bowl and cover to keep warm. Add chorizo to barbecue plate and cook for 2 to 3 minutes each side or until crisp. 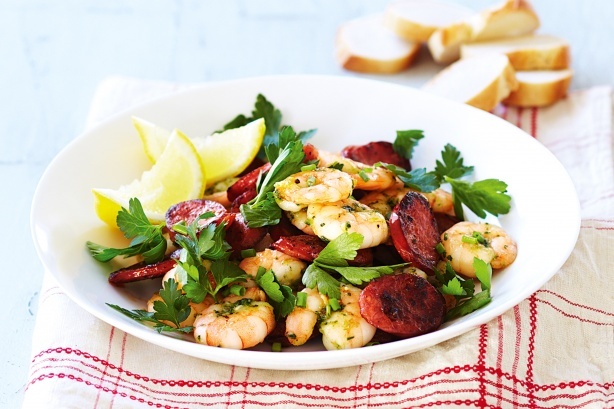 Remove chorizo from barbecue plate, add to prawns and cover. Juice half of 1 lemon and cut the remaining lemon into wedges. Add parsley, chives and 1 tablespoon lemon juice to the prawn and choirzo mixture; toss to combine. Place prawn mixture on to a serving platter. Season with freshly cracked salt and black pepper. Serve with bread, lemon wedges and aioli. Holy cannoli! I want to dive into that plate! Wow love the new layout, and the photos! What a professional and delicious looking post! Thank you, it took a while to get it right but I am loving it too! This is such a delicious recipe – you’ll have to let me know if you try it! I love, love, LOVE this recipe. It is so quick and delicious! Have you tried it?